Deepening its links in Latin America, the UC San Diego School of Global Policy and Strategy (GPS) minted a new memorandum of understanding (MOU) for student exchanges with Universidad de Chile — Instituto de Estudios Internacionales (IEI). Among the oldest postgraduate centers in Latin America, IEI emphasizes interdisciplinary analysis of topics such as international law, international relations, political science, history and the international economy. It’s the perfect pairing for GPS’s specialties in the Pacific region, as well as its strengths in quantitative analysis, explained Dorotea López Giral, assistant professor of international economics and commercial policy at Universidad de Chile. GPS Assistant Professor Gordon McCord, who oversaw the MOU’s creation, views the new partnership not just as an adventurous means for students to fulfill curriculum requirements, but as a juncture to make an authentic impact, globally. This MOU is the second to come to fruition under McCord’s watch and one in a likelihood of more student exchange programs between GPS and Latin American institutions. 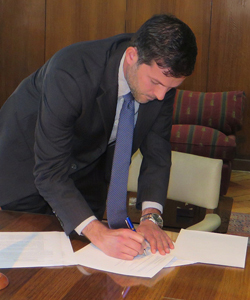 In addition to its partnership with IEI, GPS has an existing MOU with Pontificia Universidad Católica de Chile. The notion for these student exchange programs was set in motion during a GPS faculty trip to Chile two years ago. Coordinated by McCord and attended by Professors Tai Ming Cheung, Ruixue Jia and Barry Naughton, that visit to Chile in 2015 showcased the ways in which GPS’s expertise in Asia is advantageous to scholars in Chile, given the country’s reliance on China as a trading partner. Echoing Reyes’ remarks, McCord added that both Pontificia Universidad Católica de Chile and IEI are good fits for GPS students from a curricular viewpoint and particularly for those in the School’s Latin America track. “Chile, specifically, is an interesting country because it’s had the region’s most successful economic model over the last 30 years,” McCord said, and gave a nod to IEI’s faculty expertise on areas such as trade and international affairs. On the flip side, he said, students in Chile who participate in student exchanges with GPS stand to gain more than a regional expertise from the School. There also are opportunities to hone their analytical skills, including in research design and spatial analysis, plus an understanding of how science, technology, engineering and mathematics (STEM) fields coincide with policy. Not one to pigeonhole the possibilities, McCord concluded that students from all Latin American countries could benefit from being at GPS and vice versa. Incoming GPS students interested in student exchange programs in Latin America can contact Assistant Professor Gordon McCord for details.